These delicious and beautiful Caramelized Onion and Goat Cheese Phyllo Tartelettes are filled with sweet caramelized onions and then topped with a savoury goat cheese filling. They make a fantastic appetizer! Are you looking for something to serve as an appetizer for an upcoming party? If you like goat cheese then you will love these Caramelized Onion and Goat Cheese Phyllo Tartelettes! 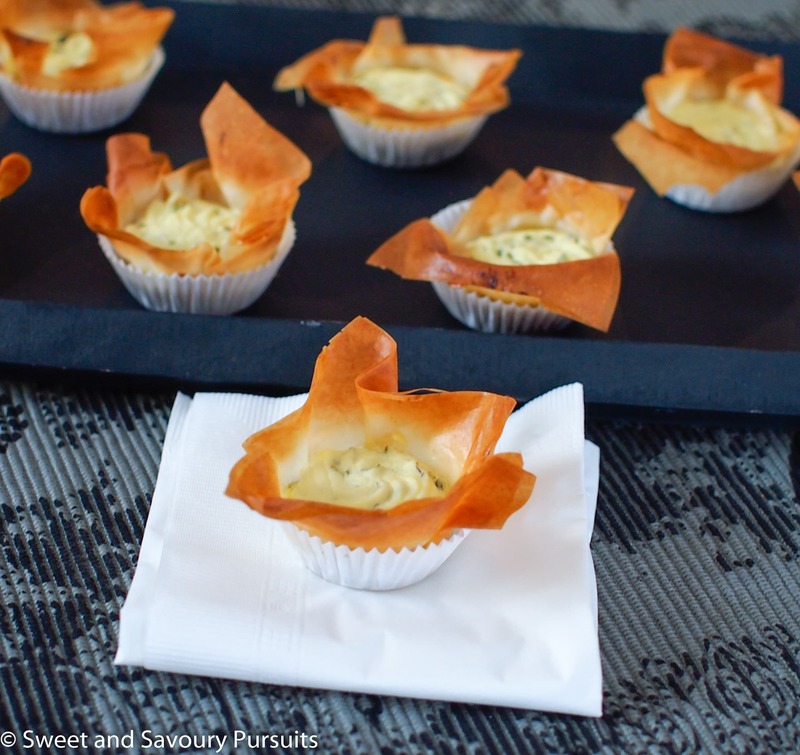 They are filled with sweet caramelized onions and then topped with a savoury goat cheese filling. But that’s not all, the shell that holds this delicious filling is made out of phyllo dough which gives these tartelettes a nice crunch and a contrasting texture. And as a bonus, the phyllo dough makes these a beautiful appetizer. This is a recipe that my cousin makes at family gatherings and that I look forward to all the time. I’ve been wanting to try the recipe for a while now, but thought it would be fun to make them with my cousin, so we finally got together and made these beautiful Caramelized Onion and Goat Cheese Phyllo Tartelettes. Had lots of fun. Thanks Amanda! These Caramelized Onion and Goat Cheese Phyllo Tartelettes are filled with sweet caramelized onions and then topped with a savoury goat cheese filling. In a wide heavy-bottomed skillet, heat 2 tablespoons of butter and one tablespoon of olive oil over medium-high heat. Add the onions and stir them so that they are well coated with the butter and oil. Cook the onions stirring often so that they cook evenly. When the onions begin to brown, add the sugar and salt and reduce the heat to medium-low. Cook the onions for approximately 15-20 minutes or until they’re brown (a deep caramel colour). Remove the caramelized onions from the heat and let cool. 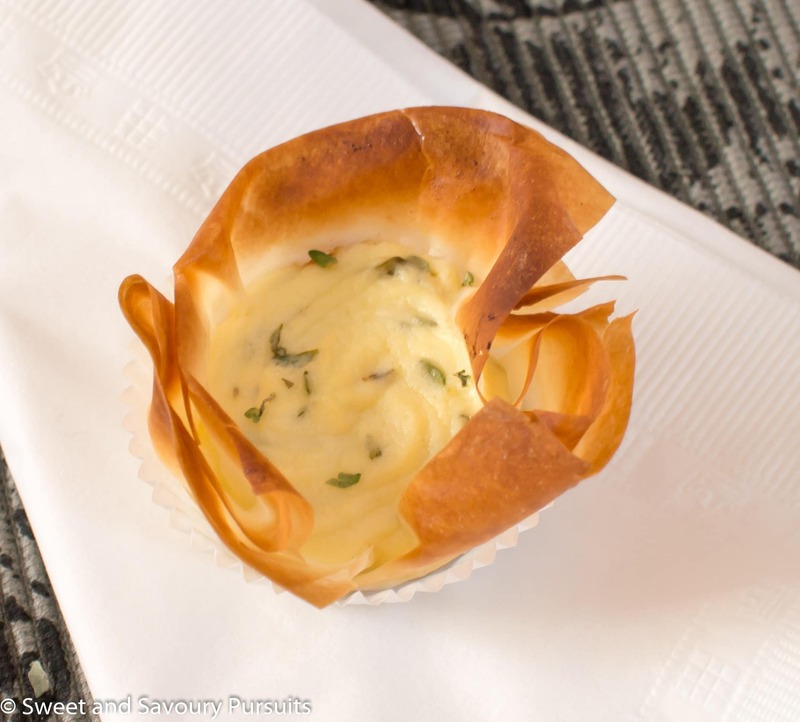 In a medium bowl combine the goat cheese, eggs, cream, and thyme. Mix with a wooden spoon until well combined. Transfer the mixture into a piping bag or into a plastic bag with a corner cut off. Melt about 3-4 tablespoons of unsalted butter in the microwave. Lay one sheet of phyllo flat on your working surface and lightly brush it with melted butter or olive oil. Lay another sheet on top. Cut into 12 equal pieces and press phyllo dough into the cups of the mini muffin tins. Portion the cooled caramelized onions into the cups, filling them about halfway. Then pipe the goat cheese mixture over the onions, filling the cups almost to the top. Bake the tartelettes until the filling is set, about 16-18 minutes. Let the tartelettes cool for a few minutes, remove them from the muffin tin and enjoy! 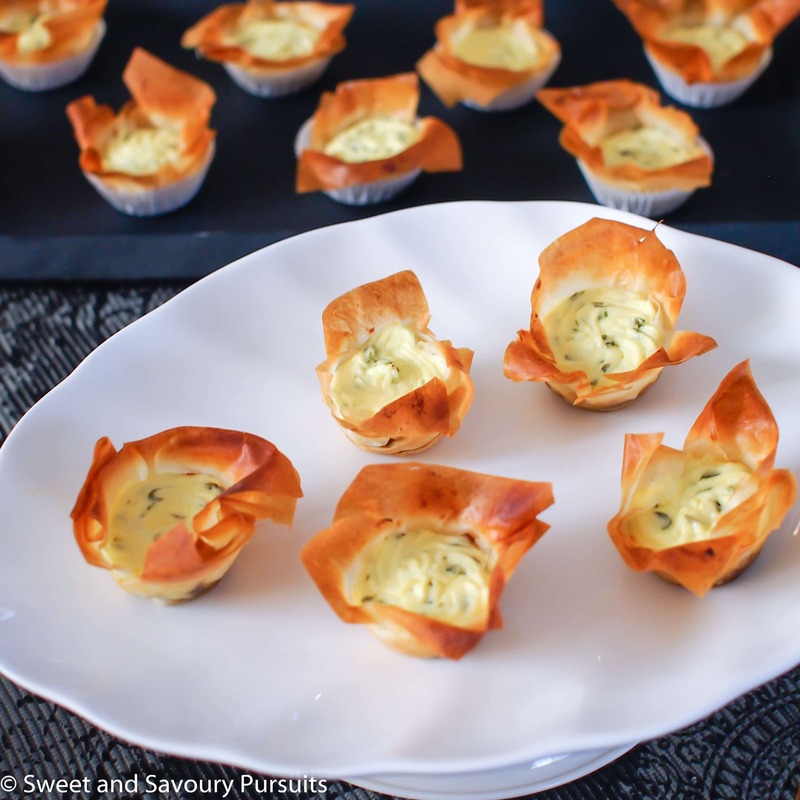 Your little phyllo cups sound great and are prefect for serving to a gathering of friends.